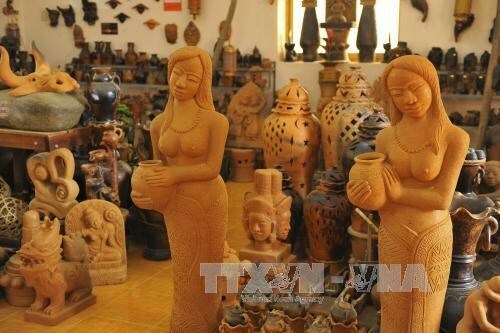 An Giang (VNA) – An exhibition themed “Cham culture in An Giang and Ninh Thuan provinces” kicked off in the Mekong Delta province of An Giang on August 1. The event was held in the lead up to the 72nd anniversary of the August Revolution and National Day (Sept. 2). As many as 131 photos and nearly 250 exhibits are on display, including ancient tools, Bau Truc pottery products, My Nghiep woven products, traditional music instruments and costumes of Cham people in Ninh Thuan province, among others. The event aimed to introduce the unique culture of the Cham ethnic minority group in An Giang and Ninh Thuan provinces.